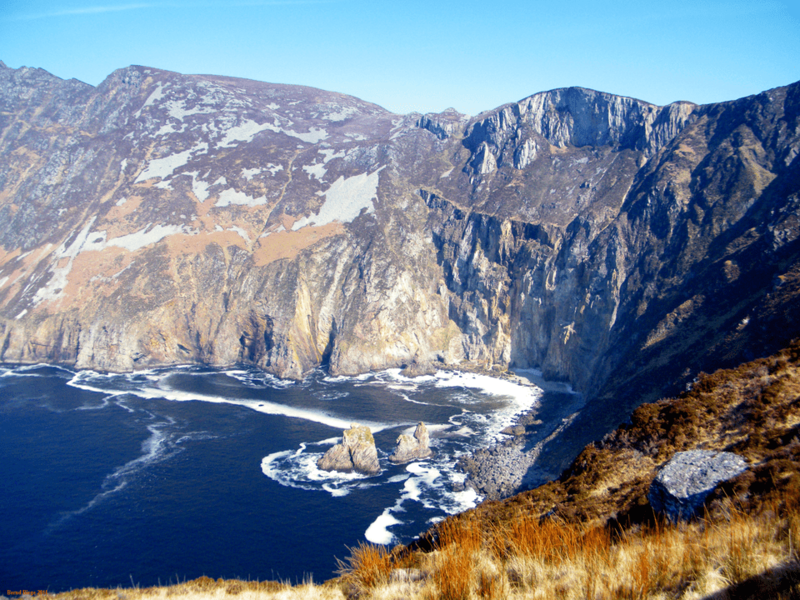 Slieve League will take your breath away, that is a promise; the cliffs of Slieve League in Donegal are the highest sea cliffs in Europe. A nearly sheer drop of roughly 2,000 feet separates the Atlantic Ocean from the highest point of the cliffs. A guaranteed lethal drop, so extra care is advised, especially with children. Slieve League is the thinking man's alternative to the Cliffs of Moher, if only for the much more natural and uncrowded experience. The difference in height is of academic interest only. Slieve League is higher but you won’t really notice. And while you pay oodles of money just for parking near the Cliffs of Moher, Slieve League is free. Why then is this cliff face in Donegal not more popular? Signposted only locally and in the middle of one of the remotest areas in Ireland, Slieve League is not easy to get to. And this will not get better once you pick up the signposted route. In fact, it will get worse: a winding, narrow and the quite frankly bumpy road takes you to a farm gate (open and, most important, close this yourself). Soon you will have reached a car park and the end of the road for larger vehicles. You can carry on if you are in a car, despite the hostile glares of walkers. But you should not suffer from vertigo; the road virtually becomes a single track and there is no margin of error (not to mention safety barriers) on the seaward side. Go slow! As far as we know, no cars have yet taken the long plunge, don't be the occupant of the first. At the definite end of the road another, smaller car park can be found. This also is the safest and most convenient platform for the truly breathtaking view. Just in front of you (provided there is no fog or low clouds) a green meadow abruptly stops and a vertical distance of around 2,000 feet away the waves crash against boulders. Boulders looking like pebbles from up here. If you want to go exploring, a path hugs the cliff edge and can be followed. Safety measures are fairly basic; watch your step and do not get distracted.